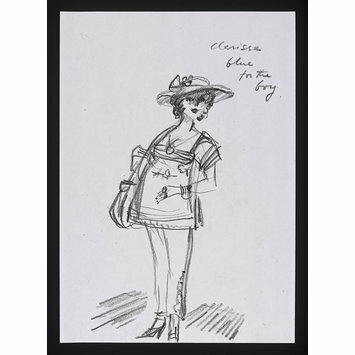 Costume design by Voytek for Caroline Bliss as Clairice Vaughnum in Sandra Deer's So Long on Lonely Street directed by Lou Stein, Watford Palace Theatre, 1986 and tour. Dubbed Voytek by George Devine, Wojciech Roman Pawel Jerzy Szendzikowski (1925-2014), was known for his distinctive designs for the stage, theatre and film. Drawing his elaborate designs from in depth analysis of each script or screenplay. Winning the Military Cross for his role in the Second World War, Voytek transferring first to Italy and then to Scotland after the end of the war where he enrolled at the Dundee Art Collage. In 1947 he moved to London, becoming a student of stage design at the Old Vic Theatre School. His career as a stage set and costume designer began with the Nottingham Playhouse whist his work on TV drama began with ABC Television and on film with Roman Polanski’s Cul-de-Sac. His theatrical works concentrated on major regional theatre and touring companies including the Royal Shakespeare Company, Nottingham Playhouse, Birmingham Repertory Theatre and Shared Experience; he was head of design at the Liverpool Playhouse from 1981-1982. 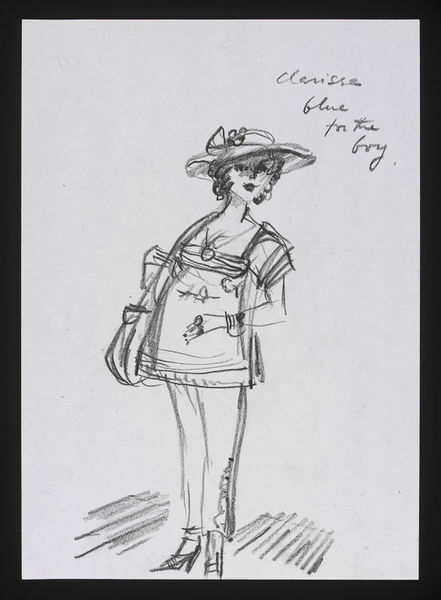 The collection this design is from also contains working drawings, model pieces, photograph, production notes as well as press cuttings and programmes relating to Voytek’s career as a production designer for the stage, television and film. Crayon on paper costume design by Voytek for Caroline Bliss as Clairice Vaughnum in Sandra Deer's So Long on Lonely Street directed by Lou Stein, Watford Palace Theatre, 1986 and tour. The design shows a woman wearing a flat wide-brimmed hat, low-cut top with necklace, tousers, and high heels. She has curly hair, carries a bag and is wearing a bracelet and rings on her left wrist and hand.